Nature Preschool: Coming this Fall! Sign-up Now For Spring Vacation Days! Summer Camp: Registration Now Open! 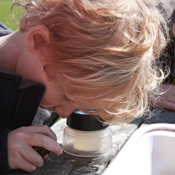 Spring Wonder Bugs: Register Now! Spring Homeschool: Registration Now Open! At the Aldo Leopold Nature Center, we know that truly living our mission and reaching as many children, families, educators, conservationists and community members as possible means expanding access now. In order to better serve our community, we are redesigning our space to increase our impact, improve our programs and better accommodate diverse populations. As you visit ALNC in the coming months, you will see signs of these changes – the first steps of an ongoing process to expand access. While we are taking great care to work around our existing programs and events, it may be a bit noisy, crowded and dusty at times. Please check out our Visit Us page for more information on access during construction. Access to our interactive theaters, exhibit area and Leopold Family Phenology Center is currently closed. We are updating and rearranging our interactive public spaces and will post updates here. Walk-in visitors, along with program participants and students, continue to have access to our outdoor interpretive trails, and, we’ll continue improving drop-in and self-guided offerings for our visitors, including re-vamped Family Trailside Backpacks, identification guides and trail maps and educational merchandise geared towards connecting and engaging visitors and families with our local habitats, flora and fauna. Access to our lobby and our indoor Nature Nooks may be limited at times, please feel free to call ahead with any questions or concerns. 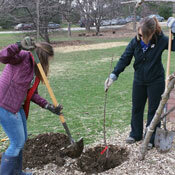 Established in 1994, the Aldo Leopold Nature Center (ALNC) is an independent, non-profit organization. Through hands-on interactive programs and special exhibits, ALNC is leading the way to engage, educate and empower the next generation of stewards of the land for a healthy, happy, and sustainable future. ALNC offers many opportunities for you and your family to connect with nature both indoors and out. In addition to our special events and education programs, our indoor children’s exhibits provide a special place for your child to learn about Monarch Butterflies and Prairies, Native Fish and Wetlands and Woodlands. Visit our Climate Science Education Center and learn about climate, weather and earth science using high-tech, interactive features found nowhere else in the region. 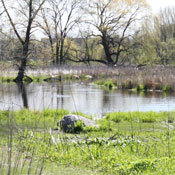 Head outside and explore our wetland, woodland and prairie trails, open sun-up to sun-down, 7 days a week! Sign your child up for our Wonder Bugs preschool programs, vacation day nature programs and home school programs for ages 5-12, or summer camps for ages 2-16. See you on the trails! Teachers! Visit our Educators’ Web Portal for newly developed pre- and post-visit activities for your class field trip. Make a commitment to Nature and become a member today! your commitment to your family!